The Grand Tour, an Amazon Original Series, launched the first of its twelve episodes in late 2016 across all existing Amazon Video marketplaces including the US, UK, Germany, Austria and Japan. The show featured former Top Gear co-hosts Jeremy Clarkson, Richard Hammond and James May—who departed from the BBC after Clarkson allegedly hit a producer—driving across four continents in exotic cars and getting into various forms of destructive automotive mischief. In this whacky reboot, audiences would be taken along for the ride with the ousted Top Gear crew as they travel the globe to discover all new potential for pushing the boundaries of speed, dignity and humanity. The relaunch of this critically acclaimed car show, as The Grand Tour, was a major coupe for Amazon Video, in its bid to gain ground on Netflix for the top spot in high-quality streaming content. On the day of its release, The Grand Tour sat squarely in the driver’s seat across Amazon and its hundreds of digital properties, establishing it as the biggest Original Series launch to date. Accompanied by a rarely-seen membership discount for new Prime member signups, the show also functioned as the flagship series for Amazon Video’s global expansion into more than 200 additional countries, and offered an exclusive behind-the-scenes X-Ray experience unmatched by any other streaming platform. Following on the heels of the first Grand Tour episodes, Amazon Video launched its Prime Video service offering—videos included with Prime membership—to customers in 240+ additional countries and territories around the world. The Grand Tour, along with other award-winning Originals, were now available to stream for millions of existing Prime members across France, Italy, Spain, and Canada; all at no additional cost to their existing membership. In addition, 650M broadband households around the world were now able to subscribe to Prime Video via the new global website PrimeVideo.com—for a special introductory price of just $2.99 (or €2.99) per month, starting with a 7-day free trial. Within the first few hours of launch, customers from around the world were already loving Prime Video and The Grand Tour, with tens of thousands of new customers across more than 100 countries and territories (spanning all the way from Argentina to Zimbabwe). Given the global reach and popularity of the The Grand Tour and its snarky co-hosts, a unique behind-the-scenes X-Ray experience was created specially for the show, featuring never-seen-before bonus content including photos, videos and exclusive commentary from the hosts. X-Ray, as you may recall from previous work on The Fashion Fund, is a feature that lets users identify actors and music within the scene of any title on Amazon Video. Customers can also discover little known facts and trivia, and use scene navigation to jump to different parts of the video. Both Amazon Video and The Grand Tour share a focus on story telling. So, bringing fans into this globally-beloved show by offering a unique behind-the-scenes look at exclusive bonus content was a natural extension of the streaming experience, one unmatched by other streaming platforms. With the release of this new behind-the-scenes feature, Amazon Video customers were able to watch bonus video content directly within X-Ray for the first time, and without leaving the playback experience, offering an immersive never-before-seen look into the making of each episode. Photo gallery functionality was also expanded beyond just cast photos, to include high-resolution images of the cars, locations and cast antics featured in each episode. And new trivia, an X-Ray feature favorite, was custom created specifically for The Grand Tour, offering customers unique insight into each episode, with the same wit and sarcastic humor as the show’s three co-hosts. At launch, The Grand Tour received unprecedented customer and critical acclaim. The show immediately took over the top spot as the most streamed Original Series premiere of all time on Amazon Video from previous record holder The Man in The High Castle. It was the top-rated TV show or movie on IMDb with an overall rating of 9.6 and over 10,000 votes, garnered a score of 97% on Rotten Tomatoes, and was rated 4.9 out of 5 stars by over 15,000 customers on Amazon. 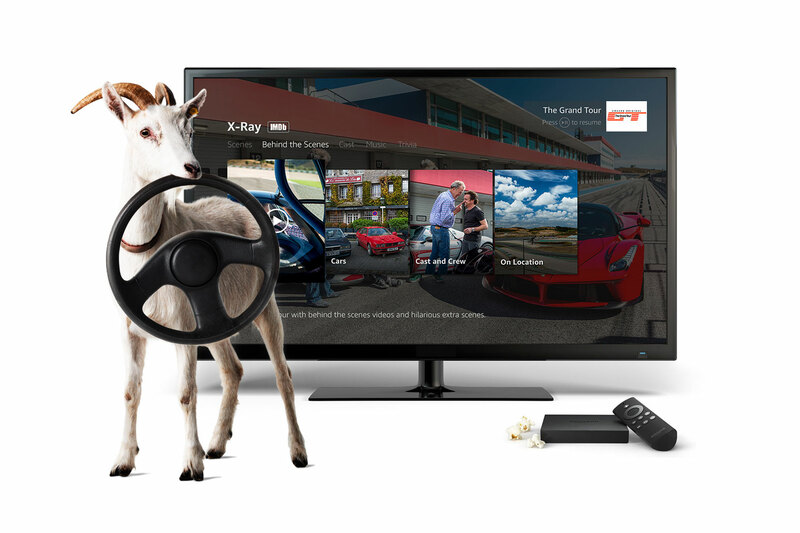 While millions of existing Prime members got online to stream the debut episode across the US, UK, Germany, Austria and Japan, the key achievement for The Grand Tour was its ability to engage a new segment of Amazon customers and convert them to Prime members. Bolstered by a one-day sale offering $20 off an annual Prime membership (US market), the series launch resulted in a record for the most new Prime signups in one day, second only to Amazon’s Prime Day. And, for all those new Prime members, X-Ray delivered on the promise to tell a deeper Grand Tour story, bringing customers along for the ride with exclusive behind-the-scenes videos and photos tailored to each episode, including over 45 video shorts and 550 photos across the season. This exciting new feature gave fans an opportunity to look inside the show without having to pump the breaks, making for a more seamless playback experience. We also incorporated a unique first-time user experience into X-Ray to drive discovery, and launched an engaging custom landing page, localized across three core Grand Tour markets (US, UK, DE/AT), to help educate customers. In the end, we delivered on the promise to tell a deeper story for both X-Ray and The Grand Tour, by engaging millions of former Top Gear fans from all around the world in new and inventive ways.